America Revealed: Austerity Riots - A Glimpse Of America's Future? Austerity Riots - A Glimpse Of America's Future? 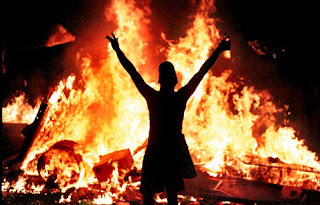 Are the austerity protests and riots happening in Greece right now a glimpse of America's future? The truth is that both nations are absolutely drowning in debt. It is just that the "day of reckoning" has already arrived for Greece but it has not arrived for the United States yet. Yes, there are some important differences between the situation in Greece and the situation in the U.S., but there are also some important similarities. Budget cuts and other austerity measures are being promoted by the political leaders of both countries. Greek citizens have reacted very negatively to the economic austerity programs that have been implemented in that nation. As budget cuts on the federal, state and local levels in the United States start to really become painful, will we eventually see the same kind of austerity riots in this country that we are currently seeing in Greece? There is a price to pay for living way, way beyond your means for decades. The citizens of Greece are now feeling that economic pain. In the United States, the pain of austerity is not being felt that severely yet. So exactly what are austerity measures? Well, in Greece they include tax increases, budget cuts and "privatization measures". The Greek government is swamped under an unpayable debt load and without international assistance the Greek government will default. But all of that "international assistance" comes with strings. The EU and the IMF are insisting on the implementation of very strict austerity measures, and the Greek people are not thrilled about this. Greek Prime Minister George Papandreou is telling the Greek people that it is their patriotic duty to accept these austerity measures, but most of the Greek population is not buying it. The truth is that these international "bailouts" are just more new loans. What the EU and the IMF are proposing is that Greece should go into even more debt and hand over even more sovereignty. But Greece will not be able to pay back these new loans either. In fact, these new loans will just enslave them to debt even further. Sadly, Greece appears destined to default sooner or later regardless. Meanwhile, big banks and big corporations are quite eager to purchase all of the juicy assets and pieces of land that the Greek government is being ordered to "privatize". Are you starting to understand why Greek citizens are so upset? 'They cut our pay by 25 percent and a lot of people in my department have not been paid for two months,' said 52 year-old civil servant Yannis Zaharopoulos. What would you do if your pay had already been cut by 25 percent, you had not been paid for two months and now the government was trying to push even more austerity measures down your throat? A year of wage and pension cuts, benefit losses and tax increases has taken its toll: almost a quarter of the population now live below the poverty line, unemployment is at a record 16% and, as the economy contracts for a third year, economists estimate that about 100,000 businesses have closed. You can see some additional pictures of these protests in Greece right here. Sadly, many believe that we could see these kinds of economic riots inside the United States eventually. Over the past several decades, the federal government, state governments and local governments have been on the greatest debt binge of all time. We have been living way, way beyond our means for so long that most of us don't even know what "normal" is supposed to look like. For example, this year the federal government will take in about 2.2 trillion dollars. It will spend about 3.7 or 3.8 trillion dollars. So what would the U.S. economy look like if the federal government adopted a balanced budget? Well, just imagine 1.5 trillion dollars being sucked out of the economy over the course of a year. If you went out today and started spending one dollar every single second, it would take you over 46,000 years to spend 1.5 trillion dollars. But the U.S. government simply cannot continue down the road that it is on. Since Barack Obama was elected, the U.S. national debt has increased by almost 4 trillion dollars. Our debt is increasing exponentially. Something has to be done. Right now the Democrats and the Republicans in Washington D.C. are fighting viciously over what to cut from the budget. Eventually a deal will be reached and at least some cuts will be made. But it is not just the federal government that is making cuts. State and local governments all over the United States are cutting back as well. Today, state and local government debt has reached at an all-time high of 22 percent of U.S. GDP. It is major, major problem that not that many people are talking about. In many areas of the country, absolutely brutal cuts are being made. From coast to coast we are seeing police, firefighters and teachers being laid off. People here are bracing for a spike in crime after the city put its police force on furlough. "Everybody's talking about 'bolt your doors, buy a gun,' " said Monty Collins, Alto's mayor, who was against the measure. But laying off police in a small Texas town is one thing. It is an entirely different thing altogether to do it in one of the most dangerous cities in the entire country. The city of Camden, New Jersey is known as "the second most dangerous city in America", but because of massive budget problems the city recently felt compelled to lay off half of the city police force. A 9-year-old boy was shot in the face Monday when he got caught in a crossfire on an otherwise quiet afternoon in East Camden's Marlton section. Things are getting crazy out there. But it isn't just impoverished areas that are having problems. The truth is that entire states are on the verge of financial meltdown. As I have written about previously, the state government of Illinois has 6 billion dollars in unpaid bills. They are so broke that they are actually leaving some bills unpaid for years. The state government of New Jersey is in such horrific financial shape that they still are facing a $10 billion budget deficit even after slashing a billion dollars from the education budget and laying off thousands of teachers. All over the U.S. we are seeing many of our greatest cities being transformed into hellholes. For example, the state government of Michigan recently approved a plan under which 70 public schools will be closed in the city of Detroit and only 72 will continue operating. It is estimated that there will be more than 60 students in a single classroom in some of the schools that remain. We are seeing austerity measures being implemented in many rural areas as well. In fact, throughout the U.S. asphalt roads are being ripped up and replaced with gravel because gravel is cheaper to maintain. The state of South Dakota has already changed over 100 miles of asphalt road into gravel, and 38 out of the 83 counties in the state of Michigan have replaced at least some of their asphalt roads with gravel roads. It is almost as if economic progress in this nation is now stuck in reverse. Sadly, many believe that even more difficult economic times are on the way. According to Saxo Bank, the "second half of 2011 will be volatile and the uncertainty almost as great as during the financial crisis." The truth is that the world is becoming a very unstable place and the next major crisis could erupt at any moment. The global financial system is so vulnerable right now that it would not take much to set off the next big global recession. The unprecedented economic prosperity that we have enjoyed for decades is coming to an end. The United States is changing. I hope that you are getting prepared for what is ahead.